While visiting a local supermarket with a reputation for having good produce, I was enjoying having my soon-to-head-back-to-college son with us. I know we swapped some light-hearted banter while my daughter found the items on her list. (She made us promise not to get gummy bears from the bulk bins, but they were on sale. And, she didn’t care if I got a bag of the almonds that were on sale, but when I did the bag tore and made a mess within the blast zone.) I don’t believe any clementine juggling took place. We would not injure innocent fruit unless we were planning on consuming it. I pause for effect. The lady behind me turns her head slightly to hear this possibly interesting fact. My daughter is not facing me, but I anticipate an eye roll. My son being a bit of a clown himself is curious what I will do in my moment. And, the cashier slows up his processing of items on the belt to hear clearly if I knew about his respiratory therapy past. “….as a male dancer.”, I finished. The lady behind me smiles. My son laughs out loud. I don’t always involve so many people in my fun. Maybe, I need to make it a goal. If it is not illegal, immoral or unethical, I should go for the smile. I will keep exploring this philosophy during the course of 2016. Maybe I will blog more…..? I will admit my son and I did have some reservations as we attempted to “place” ourselves in the various pictures. As it said in the book, the key to this art is being discrete without being excessively obvious. Our efforts largely failed on the side of being overly discrete. Possibly to the point where the distance between us and the “real” group being photographed was too far to be consequential or rankable in the annals of “photobombing”. As we counted our failed attempts, we somehow found ourselves in the line for “Pirates of the Caribbean”. My attempt to photobomb while in the “pirates” line failed on the “to obvious” side. Because of the line, it was hard to walk-on and pretend like it didn’t happen. So, my lips got ahead of my head, and I spilled my guts and told the photographer (an early 20’s girl traveling with her sister, mom, and boyfriends) of my son and my “challenge”. She was overly sympathetic. She even snapped another picture almost immediately where I could “photobomb” without any remorse. It was a very liberating feeling. No upset photographer, and I got to score a photobomb. The rest of the 1/2 hour or so journey through the Pirates line was spent talking with 2 or 3 or the members of this family. One used to live in Dallas. (mom) One was a football player for the U of South Alabama football team (They got beat by Bowling Green in their bowl game. ), and one was his girlfriend. (The rest of the crew was not as chatty with outsiders.) It was a good way to get my “fix” and get myself into the fun that is available while wandering through lines that are a necessary part of the pre-ride experience. Later in the day, we saw this same family in the “Haunted Mansion” line. I made a comment about “not photobombing anymore” as we passed in the wandering line. As the line got closer to entry, we ended up where we could have talked in the line. But, it seems friendships formed while photobombing are not long-lasting friendships. And, as much as I felt semi-bonds were formed earlier in the day, it just seems appropriate the bonds formed while engaging in such destructive behavior were horribly short-lived. Saturday was the culmination of many hours of labor for my 8th grade robotics team. Although I was their “coach”, they didn’t really need me very much. They are all very good students, and my primary role was keeping them on “task” over the past few months. The FLL program they participated in is very well organized. Feel free to follow the link for ALL the info you may want to find out about the program. Each of the 26 teams at this robot judging, received an 8′ x 8′ area for their team to setup. My team’s area was right by the main entrance. The robot course tables (see above) were just in front of our area inside the main entrance. 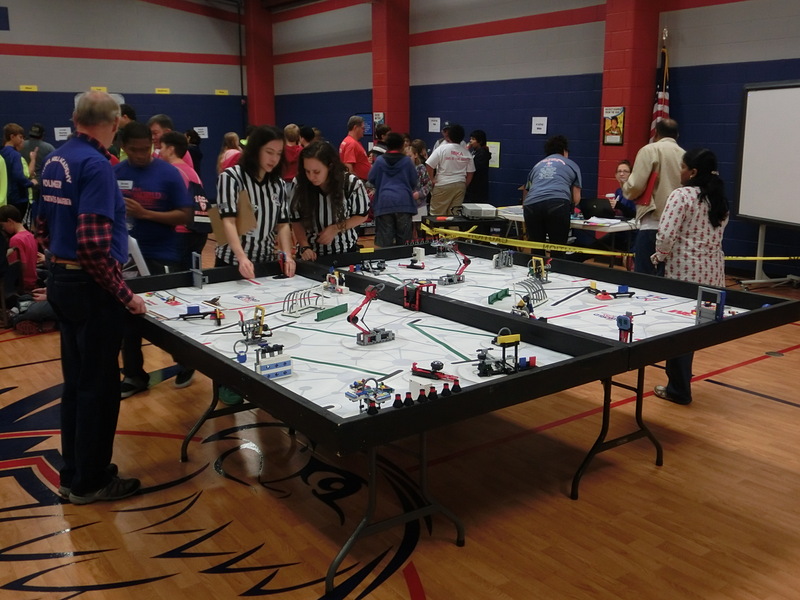 Whenever a judging took place, all of the parents who were not permitted to enter any of the judging areas, flocked to watch their child’s team robot do all of the task it could in the 2:30 minutes it was given. Additionally, each team got 3 chances to run this course. Hopefully, my description implies it got a little crowded in front of our “space”. As it worked out, we willing relinquished a portion of our space before eminent domain was necessary. We huddled in the back half of our space knowing it was a contribution we were unlikely to be thanked for offering. Other than one of the kids getting sick in the bathroom and having to go home early, the morning was pretty smooth. Lunch time for 40 (30 kids and 10 adults) equals about 16 pizzas, or at least it did today. Although we (the emphasis on the kids) tried to eat them all, about 1/4 of them made it home with us. After lunch, my team had about an hour before their final robot run. As I walked into the gym, a quick rightward glance showed my chair was gone. I gave it a little time thinking someone had borrowed it and would return it after lunch. As my team worked with their robot to figure out what programming changes they needed to make to allow their robots to work on the slightly larger (only 1/4 inch or so, but it makes a difference) course, I walked the gym looking for where my chair may have taken sanctuary. I received a few looks as my glances moved from chair to chair. As it turned out, the only card table style chair was right across from our space. I was sure my chair was more gray rather than the olive gray offered by this chair candidate. I roamed the halls and the cafeteria trying to determine if someone had hijacked my chair to any of these other locations. I thought I might getting a text with a ransom request, but it never came. I guilted someone into giving up their chair to the “poor guy who lost his”, and I mentioned my predicament to the staff. I didn’t want momma to think I lost it without at least trying. While I suffered through this possible loss of the chair, my robot team had a very good run on their third try. Apparently, my “hands off” coaching style was continuing to prove itself yet again. As the meet was winding toward awards, I approached the group where “my” chair was setting. They claimed it showed up right before lunch. Since there was difference in time of disappearance, I was pretty sure I would be walking out with this chair even if my chair didn’t turn up. As it turned out, my chair obsession in no way hindered my daughter’s team from success. They got second (or third) place at this meet. And, since the top 6 were going to the regional on February 14th, it looks like my Valentine’s Day would not be spent smelling roses or eating chocolate. Fortunately, the chair I walked out with did have at least one twin at our home. I credit my chair obsession as the reason for the team’s success. Kids like a coach better when he is not in helicopter-mode. A visit to Sam’s brought a new 3 pound container of green grapes into the house. While not all past vine dwellers were as welcome, I am happy to say my daughter picked very well today. The texture gave slight resistance and the skin was just the right firm. The only thing slightly wrong with them was their size! 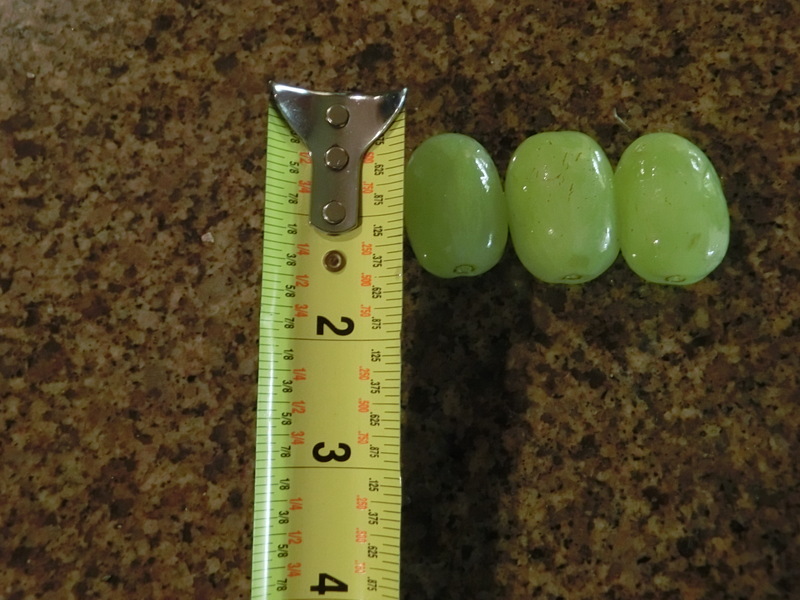 Most of the grapes were as large as the top half of my thumb! As we ate some of them with lunch, the smaller mouthed individuals made each grape last for 2 or 3 bites before the grape was fully consumed. After lunch, my son decided to participate in a game we occasionally do to assist in father-son bonding. Usually the game consists of tossing M&Ms into the air on an arc toward his head. If I do my job correctly, a couple small neck adjustments will allow the M&M to easily be caught in his mouth. Because we apparently needed to do some “power bonding”, we attempted the M&M trick with these over-sized, under-seeded fruit ovals. My sons skills were quickly evident. He adjusted how far he opened his mouth (he had to open it ALL of the way), but otherwise, it was the same eye-mouth coordination as before. The first two grapes followed this pattern. He zeroed in on the grape, caught it in his mouth, and he was careful not to choke on the green projectile. Although I did not consciously want to “mix it up”, my sub-conscious was likely a little bored. The third grape did embark on an arc just like the other grapes, but as it knuckle balled (my fingers planned this without my realizing it) toward my sons mouth, it ended up being to great of a challenge-the “center” of the grape was to hard to calculate . It smacked him in his upper lip as his mouth was anticipating the impact. We did allow a “knuckle-less grape” do over which was much more successful. While fruit does not always bring people together, I am glad my son and I can “rework” old games with grapes as a centerpiece. I have not always been a perfect father, but on the days when I “know” I have done a pretty good job, it usually involves a bit of laughter and a dash of ridiculous. As I sat down at McDonald’s today to tap into their internet and slurp on an slightly sweetened iced tea, I was greeted by a family sitting two tables in front of me. The dad in his early 20’s had droopy jeans, a knitted hat pulled over his head with a bit of hair sticking out, an unshaven face, and a couple of tattoos above his elbow peaking out from under his t-shirt. The mother had her back to me. She had shoulder length black hair with a black t-shirt. The youngest child (under 2) was in a highchair with his hair combed into a rooster type style. The older brother (no older than 4) was facing me, but blocked by his mother. He looked to be his younger brother PLUS 2 or 3 years. As I notice the youngest brother begging pancakes off of his father’s plate, I see the smile on dad’s face as he continues to fill the nearly perpetually gaping mouth. I see little brother reach for dad as he goes to refill his Dr. Pepper (Don’t leave me dad.) . I see mom haul little brother to the bathroom to change a diaper. I see big brother watching everything going on while keeping the hand moving from plate to mouth. I see how both boys are wearing clothes that could easily be described as pajamas. I decide I will say something to the parents (see Blessed Eggs), but as they get up from their table, they go into the play area. "You must be fun parents. Not every parent would let their kids wear pajamas on a     drizzly day." "Thank you. The boys insisted. They just got their new pajamas yesterday. ", she       replied. "You guys enjoy the rest of your day. ", I said with a smile. It isn’t your appearance or my standards that make you a fun parent. It is how your kids see you. I have no idea what this family’s home looks like, but I know this family knows how to love their kids. I am not so arrogant to think my words made any difference in their day, but saying the words did in mine. Syrup on the pajamas? No problem. I am sure this loving mom will have them washed for bed tonight.